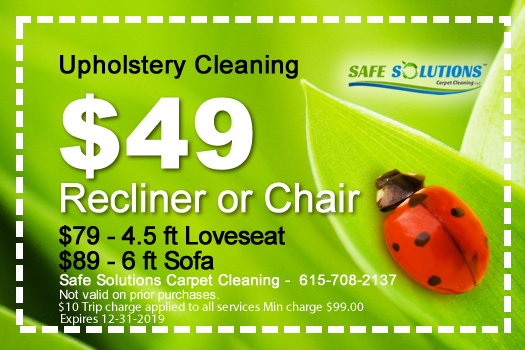 Safe Solutions Upholstery Cleaning Services uses a cleaner that lifts the dirt and oils from upholstered material. After our cleaner is applied, we utilize a low pressure rinse system, being extremely careful not to drive dirt deeper into the furniture. Some companies use soap to clean furniture. This leaves your furniture feeling sticky. Safe Solutions will get your furniture looking and feeling clean again! We have the expertise and experience you can rely on. Many products being sold in the market place are not appropriate for leather. Many contain silicon that will break down the leather causing it to dry and crack. Safe Solutions use some of the best leather care products available and has the knowledge to apply them correctly. Trust Safe Solutions to care for your leather furniture. » Whatever the Upholstery Dirt, Odor, or Stain, Safe Solutions has you covered!